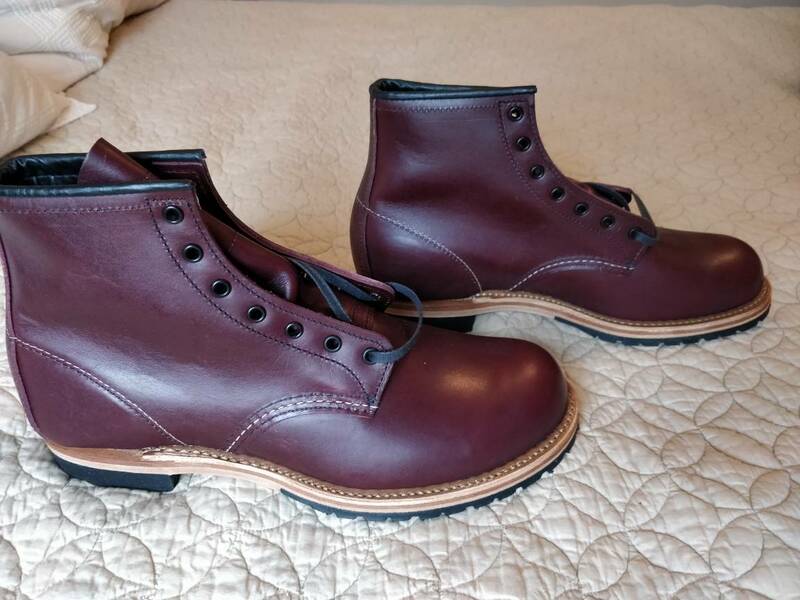 Is there any consensus recommendation between thorogood and red wing? Yeah, Red Wing is a superior product, from stitching, better leather, sole quality, etc. Plus they look better. This is probably true, but I have both Red Wing and Thorogood boots, and I feel like I got 90% of the Red Wing in the Thorogood at much less than 90% of the price. The Iron Ranger equivalents in the link are Horween leather as well. I’d not be worried about wearing them. Any insight into comparison between Iron Rangers and TBC Captain boots? I will preface this by stating that I do not own either boot. Based on photos, the Red Wings looks "chunkier" compared to the "sleeker" Thursday boot. The Redwing equivalent of the Thursday captain would be a Beekman I think. If you meant Beckman, that's not a captoe. Here they are. I don't see anything that jumps out as seconds. Maybe the small defect in the closeup picture? For something that I plan on wearing outdoors etc I can live with this.